The stunning landscape of Tràm Chim National Park is at its most attractive during the "floating water season", or flooding season, from September to December. Located in Đồng Tháp Province’s Tam Nông District, the park is the fourth Ramsar site in Việt Nam and the 2,000th worldwide. The park has a special-use forest with distinctive wetland ecosystems spanning more than 7,300 hectares. Visitors can spot over 231 species of aquatic birds, including 16 rare breeds such as the Burmese Sarus crane, greater adjutant, black-headed ibis, black-faced spoonbill, and great-billed heron. They can also observe breeding activities of many rare birds, following the paths to Section A2 of the park. The breeding area, covering two to three hectares of land, is located six kilometres from the park’s centre. Each tree contains four to six bird nests, which have two to four eggs or baby birds each. The sight of all these nests makes the area, especially during the flooding season, fascinating to watch. 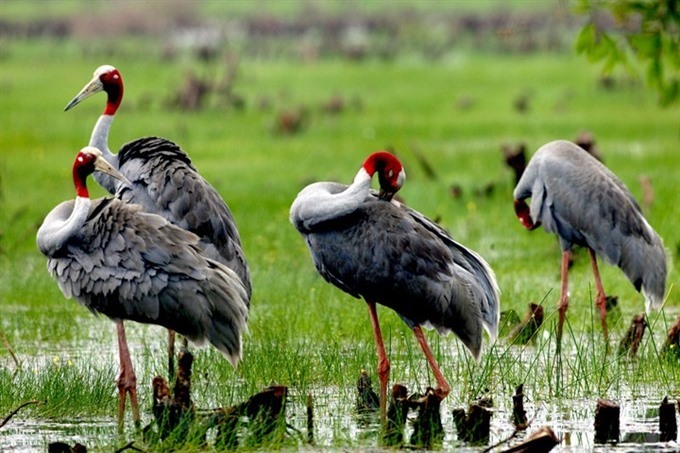 Nguyễn Hoàng Minh Hải, the park’s head of the Science and International Corporation Department, said that birds’ breeding activities were first noticed in 2007, but the park did not open the area for tourism purposes until 2013. The natural state of the park has been preserved through regular inspections, rescue teams for baby birds, and stocks of fish to attract birds to nest. The park, a miniature version of Đồng Tháp Mười region, has 130 types of precious plants and 130 kinds of freshwater fish. Pink lotus fields, bright green acacias and thousands of white storks form a beautiful sight in the flooding season. Here and there, birds sing while others swing by the water surface to catch fish. Taking advantage of the flooding season, tourism authority in the province offers tourists a chance to work like regular fishermen, and enjoy local food and beverages. Lê Hoàng Long, director of the Tràm Chim Resort, said the period between September and December is the peak tourist season. Though tourism services during the flooding season were only recently introduced, they have become a top priority among visitors to Đồng Tháp. The service is offered at Station C4 and Watchtower 3 in Section A1, and at Canal 1 in Section A2, covering 130ha of land. Each visitor, guided by locals, will be given a maximum number of three fishing tools to use in the area, where they can sleep overnight on a bamboo mat or hammock. To provide visitors with well-rounded experiences, the park authority often organises tours around Section A1 via road or waterway. Tourists can visit the only fish museum in the Mekong Delta where freshwater fish are exhibited. Huỳnh Thị Thanh Tuyền, who lives in HCM City, is originally from Đồng Tháp, but over the years, has forgotten what should be done during the flooding season. 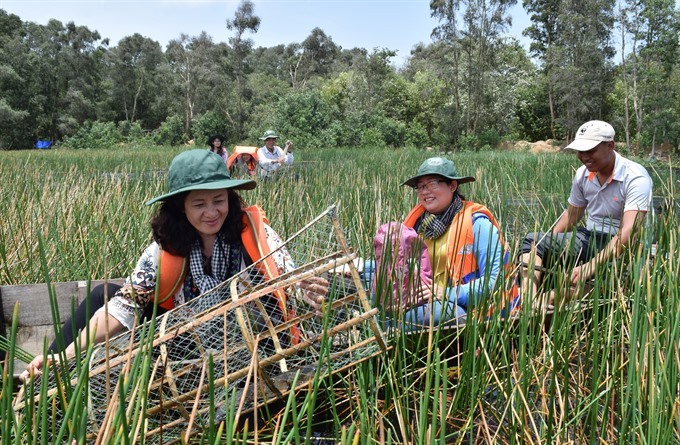 She said she was thrilled to be able to install eel catcher traps and spread fishing nets during her recent trip to Đồng Tháp. A tourist only needs to spend VNĐ150,000 to 250,000 per day at a homestay and enjoy local dishes like lẩu lươn (eel hotpot) and canh cá chua cay (peppery-sour fish soup), among others. With an affordable cost and authentic experience, many visitors choose homestays instead of hotels. In the first nine months of the year, the park attracted 66,000 arrivals, with more than 98 per cent of them local visitors. More than VNĐ6.7 billion, up 28 per cent year on year, was received during the period. Nguyễn Văn Dương, chairman of the provincial People’s Committee, said the park’s significant ecosystem and wetlands were recognised under international standards and that it was important to preserve the park’s biodiversity and manage tourism well. “Ecotourism has a close relationship with the natural environment,” he said, adding that authorities must conduct research before opening new services.